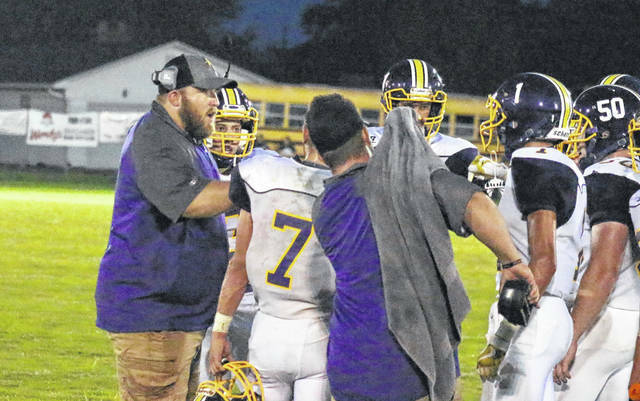 Southern head football coach Cassady Willford (left) talks to his team during a break in the action in the Tornadoes’ shut out win on Sept. 7 in Mason, W.Va.
Last Week: Athens defeated Logan 21-14, in Logan; Meigs lost to Nelsonville-York 30-22, in Nelsonville. Last meeting between the teams: Oct. 6, 2017. Athens won 19-18 in The Plains. Current head-to-head streak: Athens has won 9 straight. AHS offense last week: 109 rushing yards, 165 passing yards. MHS offense last week: 107 rushing yards, 271 passing yards. AHS offensive leaders last week: QB Clay Davis 15-of-24, 165 yards, 1TD, 1INT; RB Evan Adams 23 carries, 65 yards 1TD; WR Nate Trainer 9 receptions, 90 yards. MHS offensive leaders last week: QB Coulter Cleland 20-of-34, 271 yards, 2TDs; RB Abe Lundy 3 carried, 48 yards; WR Weston Baer 6 receptions, 106 yards, 2TDs. AHS defense last week: 162 rushing yards, 144 passing yards. MHS defense last week: 249 rushing yards, 191 passing yards. 1. Athens holds an 20-15 record over Meigs in all-time meetings. The last time the Marauders claimed victory over the Bulldogs was on Sept. 12, 2008. That was the first season Athens was a member of the TVC Ohio. Athens’ last trip to Rocksprings was on Oct. 7, 2016 and resulted in a 62-46 Bulldogs win. 2. Last week, the Maroon and Gold led 22-10 at halftime, but surrendered 20 unanswered points in the second half. A total of seven different Marauders caught passes in last week’s setback, matching a season-high. 3. The Marauders have surpassed 300 yards of total offense in four consecutive games. The MHS passing game a trio of 200-yard games this fall, with Meigs rushing for at least 100 yards four times. 4. To this point in the season, Meigs and Athens have two common opponents, in Vinton County and Logan. Along with a seven-point win over the Chieftains last week, the Bulldogs claimed a 29-point victory over VCHS in Week 5. Meigs defeated the Vikings in overtime in Week 4, but lost to Logan by 10 in Week 3. 5. Athens enters the week at ninth in the Region 11 standings, and is one of six teams in the region with a 5-1 record. The Marauders are 15th in the Region 15 standings, and MHS is one of 14 teams below .500 in the region. Last Week: Eastern defeated Wahama 42-0, in Mason; Federal Hocking lost to Belpre 41-8, in Belpre. Last meeting between the teams: Sept. 15, 2017. Eastern won 35-14 in Tuppers Plains. Current head-to-head streak: Eastern has won 4 straight. EHS offense last week: 270 rushing yards, 147 passing yards. FHHS offense last week: 123 rushing yards, 123 passing yards. EHS offensive leaders last week: QB Conner Ridenour 8-of-11, 147 yards, 2TDs; RB Blake Newland 21 carries, 150 yards, 2TDs; WR Blaise Facemyer 4 receptions, 147 yards, 1TD. FHHS offensive leaders last week: QB Hunter Smith 7-of-14, 123 yards, 1TD, 1INT; RB Hunter Smith 14 carries, 50 yards; WR Noah Robinson 4 carries, 95 yards. EHS defense last week: 60 rushing yards, 52 passing yards. FHHS defense last week: 332 rushing yards, 0 passing yards. 1. The Lancers haven’t defeated Eastern since Oct. 25, 2013, when the Maroon and Gold claimed a 20-14 decision in Tuppers Plains. Eastern’s last trip to Stewart was on Sept. 16, 2016 and resulted in a 37-0 Eagles win. 2. Last week, the Eagles recorded their first shut out win of the season. Eastern’s last shut out victory came in Week 3 of last season, over Green. EHS has now blanked at least one opponent in three straight years. 3. The Lancers last tasted victory on Oct. 24, 2014, by a 16-14 count over Waterford. FHHS has lost 36 straight games, including 29 consecutive in the TVC Hocking. 4. The Eagles have held three straight opponents under 230 yards of total offense. The EHS defense has four takeaways on the season and has allowed a total of 70 first downs. 5. Eastern enters the week at 13 in the Region 27 rankings, while Federal Hocking is on of three teams tied at 24th. A total of 16 teams in the region are below .500 going into Week 7. Last Week: Southern defeated South Gallia 54-12, in Racine; Ravenswood lost to Ritchie County 32-14, in Ellenboro. SHS offense last week: 149 rushing yards, 135 passing yards. RHS offense last week: 193 rushing yards, 11 passing yards. SHS offensive leaders last week: QB Logan Drummer 7-of-11, 135 yards, 2TDs; RB Trey McNickle 13 carries, 154 yards, 3TDs; WR Trey McNickle 3 receptions, 69 yards, 1TD. RHS offensive leaders last week: QB Max Hilton 1-of-7, 11 yards; RB Chase Hood 6 carries, 83 yards; WR Wayne Stephenson 1 reception, 11 yards. SHS defense last week: 187 rushing yards, 5 passing yards. RHS defense last week: 194 rushing yards, 175 passing yards. 1. Just 11 miles separate these two schools, but this is their first-ever gridiron meeting. Ravenswood is 1-2 in all-time meetings with Meigs County schools, defeating Meigs in 2001, while falling to Pomeroy in 1937 and Rutland in 1924. 2. Last Friday marked the fourth time this season that Southern has defeated a team by 40-or-more points. SHS had three 40-point victories last season. The Tornado defense came up with three takeaways and its third touchdown of the season. 3. The Tornadoes have scored 289 points so far this year, 10 shy of their season total from last year. The Purple and Gold have surpassed 50 points three times this year, equaling their total from the rest of the decade. SHS is currently 8th in Region 27. 4. The Red Devils have dropped three straight decisions since their 2-0 start, falling to 24th in the Class A rankings. RHS has been outscored 115-to-36 in that time. Ravenswood had a trio of ball carries surpass the 50-yard mark in last week’s setback. 5. This game will be the Wendy’s Friday Night Rivals Game of the Week Mark Martin of WCHS will be calling the game live on television, and the game will also be available at wchstv.com on the internet. Check local listings for channel information.